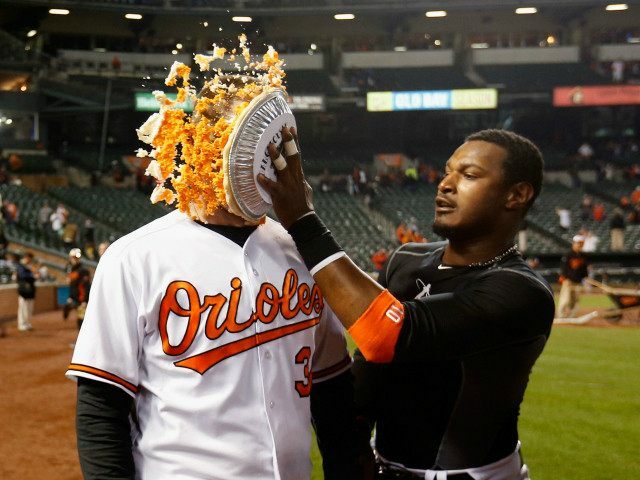 The Baltimore Orioles no-funniks banned pie-in-the-face celebrations for “safety reasons” prior to this season. Adam Jones took exactly one game to flout the new rules. Matt Wieters smashed a game-winning single. Then Adam Jones smashed a postgame pie in the catcher’s face. Or was it a cake? The 3-2 victory over the Minnesota Twins brought sunshine to Baltimore after sunset following a lengthy rain delay. The Orioles trail the 2-0 Blue Jays in the American League East by a half game. The Twins, who last won on Opening Day in 2008, sit alone in last place in the AL Central. Like all good straight men, the Orioles took a we-are-serious-this-time approach to the pie ban before the season. It’s no ones fault. It’s just about safety. At the end of the day it can be dangerous so we’re being smart. Like so many athletes, Jones found a creative way around the killjoy rules.